When you think of Cowboy Beans Frijoles Charros, think of tender, slightly smoky beans flavored with bacon and onion and something with a bit of a kick. Yep, I’m going there again: a little poblano pepper, a little jalapeno or serrano. They’re saucy and sassy at the same time. 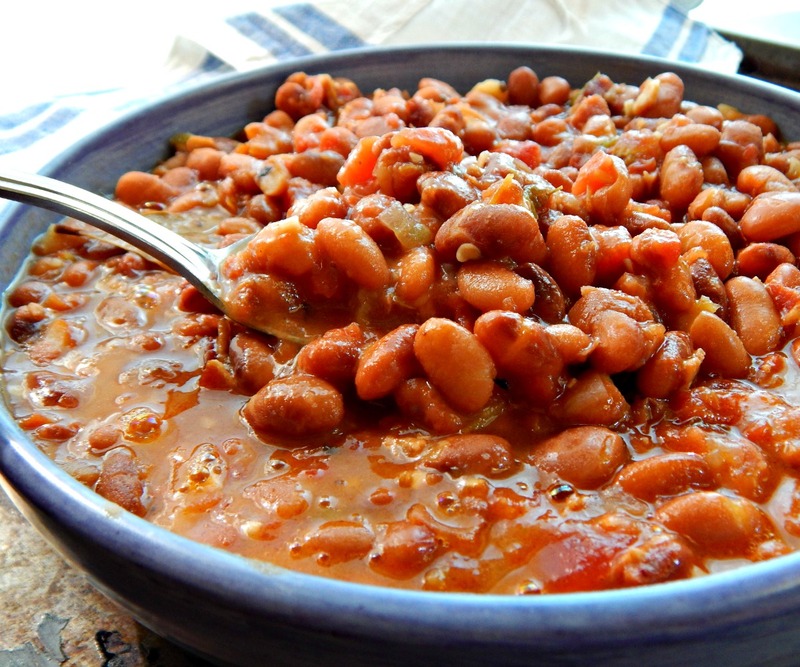 Cowboy Beans Frijoles Charros is a traditional Mexican Dish, named after the Mexican Cowboys, the Charros. They are almost a stew of pintos, onion, garlic, and bacon and can include chiles, cilantro, tomatoes, along with ham, sausage, pork or chorizo. Serve Frijoles Charros as a main dish (maybe cornbread or tortillas on the side) or as a side for any Southwestern or Tex Mex or Mexican food. They’re great just slopped in a tortilla and rolled up as a quick burrito, by themselves, maybe with rice or any other filling you’d like along with the beans. These aren’t a copycat Chipotle recipe (they are sooo much better) but can be used in a burrito just like Chipotle’s beans. Maybe in the Copycat Chipotle Chicken Burrito recipe, below. I’ve given you several links as options that go great with Frijoles Charros. I adapted this recipe for the Instant Pot from a recipe developed by J. Kenji López-Alt of Serious Eats. At first I was a bit taken aback by his use of canned fire-roasted tomatoes in what is normally a very simple, traditional dish. I threw caution to the wind (mostly because I didn’t feel much like charring and peeling my own poblanos, tomatoes, and onions in 90-degree heat) and tossed in Rotel. It was the right call. Beans are known to be a bit of a pain to cook. There is the soaking and the waiting and long hours of cooking. And traditional cooking methods tend to have a lot of stirring or watching when made stovetop or in the oven. The pressure cooker comes to the rescue. A few minutes for a quick soak, then the ingredients are dumped in. While it can take a good bit of time to cook beans, even in the pressure cooker, what you don’t need to worry about is babysitting. You don’t need to stir, you don’t need to check them, and you don’t have to worry about them drying out or scorching. The poor bean. It has a reputation. The unmentionable one. There are ways to mitigate that including eating more beans! Soaking and rinsing helps with that, too. Beans are so healthy and so full of good things (see what the World’s Healthiest Foods has to say about the Pinto) that they are well worth spending a little time getting comfy with them. Beans and rice are also, combined, an excellent source of protein, and you’ll see beans and rice served together in many cultures throughout the world. Sort through beans, removing any stones or dirt, rinse well. Add to Instant Pot along with 2 teaspoons salt and 8 cups water. Set to saute (high) and bring to a boil. Immediately place on lid and lock, use the manual function to set to high pressure and two minutes of time. When time is up, allow to go to the keep warm function for 10 minutes. Release any remaining pressure in short bursts but watch the valve. If any foam or bits of beans come out, stop immediately (the valve may clog) wait about 10 minutes and release any remaining pressure, again in short bursts. Drain beans and rinse well. Rinse the Instant Pot liner, along with the lid if there is bean residue or foam on it. Replace the liner and set Instant Pot to Saute (high) and add bacon, stirring until the fat is rendered and it is starting to brown around the edges, about five minutes. Add the onions and chilis and cook, stirring, until softened and starting to brown, about four minutes. Add garlic and cook until fragrant. Add the tomatoes or Rotel and cook, stirring up and brown bits. Add in beans, stock, bay leaves, salt, epazote, if using, or oregano. Replace the lid and set to the Bean setting (high, 30 minutes.) When time is up, allow to go to the warm function and sit for 10 minutes. Release any remaining pressure manually, again watching for any foam from the valve. Taste and add liquid smoke and season if necessary, discard bay leaves. To slightly thicken beans, stir gently. Add cilantro if desired. Keeps refrigerated for one week, may be frozen. Note: the two cans of Rotel, combined, had one cup of liquid. If making any substitutions, make sure that there is a cup of liquid, if not make up the difference with broth or water. This entry was posted in Click here for Bargain Meals, Click here for Fabulous Food Posts and tagged Bargain Meal of the Week, Dried Beans, hearty sides, Hot Peppers, Instant Pot, J. Kenji López-Alt, Jalapeno, Legumes & Pulses, Mexican or Southwestern, pinto beans, Rotel, serious eats, serrano, Side, Vegetable Side. Bookmark the permalink. This is an older post – but hoping for a response. If you have time and DO pre-soak your beans overnight, can you eliminate the pre-soak part of this recipe? Or is an overnight pre-soak not recommended? We will be working on it for a long time, I’m afraid!! Sounds like a big job Mollie! We just have a little patch of bricks out our back door– doesn’t need much upkeep, but does have splashes of yellow paint from projects out there with the grand-girls! Hope the work goes swimmingly! hugs hugs! Thanks, Petra. They’re so good! If I do say so, lol! I love beans and this is the type of bean recipe I am looking for. Too often the beans are sweet. Insta pot for me! I love cooking beans in any pressure cooker – I’ve made them a lot in my stovetop pressure cooker but this was the first go with the insta pot and they were just perfect. 🙂 I’m with you about the sugar, too, although every once in awhile I’ll do a recipe like that – I’d rather save my carbs for some delish dessert! Just in time! I have a client to cook cowboy beans for this Thursday! Thanks! Beans are hugely popular in my house, Mollie. My husband would go mad for this. Smoky beans with bacon – yum! Oooh yum, I love these kind of beans.I make a big ol’ pot of pinto beans with onions and jalapenos every single morning for my cart. People seem to LOVE them! I make a very similar version of these (not for my cart) and add a can of beer to them to make Borracho Beans (Drunken Beans). All good. Beans are great, Mollie! I’ve never had Drunken Beans! I just know I’d loooove them!! 🙂 Maybe you SHOULD make them for your cart! Love the recipe, it reminds me of the country side and my grandparents! Amazon prime day is tomorrow and they usually have a good deal on instant pots from what I hear. I literally JUST went on a diatribe at the dinner table about how much I love beans, like Bubba from Forrest Gump said with shrimp, and cowboy beans made my list. Yum! Yours look so good! Hah! Beans are just so good, you’ve got to let the world know!! I think an insta pot might be my prime day present to myself! You go girl! It will be fun to see what you do with it…I’ve only scratched the surface!